Typing Chimp Character is the next generation of writing software, combining the power of the Enneagram personality-typing system and the latest technology. Character is a cross-platform software package that offers simple yet powerful character-generating tools in an easy-to-use interface. 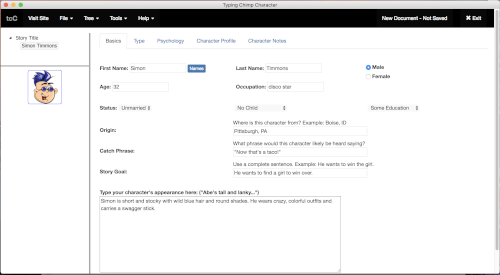 Instantly generate character profiles and descriptions. Many other story development programs on the market give a half-hearted nod to the process of creating characters. Usually there will be some character component where you fill in a name and favorite color. Character is the only product on the market that starts with character and offers a serious number of tools and features to help you develop a fully realized character from start to finish. Quickly generate a complete profile in seconds. Simply fill in some basic info and select your character's mental health, story arc direction, and personality type (for example, "a principled, moral person on a mission" or "a purposeful but controlling leader"). Then hit a button to generate a character profile. Then use your writing skills and built-in tools to refine and develop that profile to a complete character sketch. You can create as many characters as you like in one Character project document. Which makes it easy to keep Character open while you write so you can refer back to your characters as you write your story wherever you do your writing. If you use Scrivener, use our built-in sync feature to send all your character sketches to Scrivener so they are available there as you write. You could also just print or save them in MS Word to use there. Character works great with any other program you're using. It also includes an "always-on-top" feature to keep your character profiles always at your finger tips throughout the story-writing process - no matter where you're writing your story. Enneagram-based character generator instantly creates a character spine. Character-development tools help you detail your character. A quick reference system gives you professional guidance on concepts of character development. 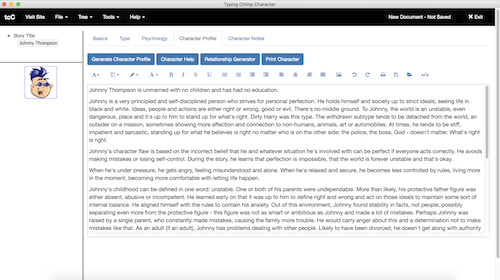 "Always-on-Top" provides writers access to Character Writer throughout the entire writing process to keep characters consistent and realistic. New "Psychology" section allows you to browse a large list of psychological issues based on the DSM-IV. Export your characters to Scrivener for easy integration. Go back and edit in Character and re-sync your characters with Scrivener. And the best part is that once you purchase this powerful character-development program, you can use it forever. There are no further fees, no in-app purchases, no subscription costs. You bought it. It's yours completely to use as much as you like, whenever and wherever you like. Boom. Click the button below to purchase and download the program. Thanks!